Is mise Santo, agus is breá liom Scoil Santain. 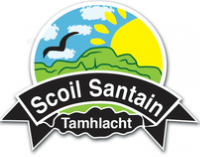 Is í Scoil Santain an Scoil is fearr ar domhan! Is maith liom peil, Is maith liom teilifís, ach is fuath liom obair bhaile! Cén múinteoir atá i gcónaí tinn? Cén múinteoir atá go hiontach ag imirt darts? Cad a dúirt an bó dána nuair a tháinig sé abhaile? Is fuath liom an 'moo'nteoir!! Níl aon tóin tinn mar do thóin tinn féin!! Na bean Joe ar an mbanjo go deo!! Gníomhaíochtaí, Fíricí, agus cluichí bunaithe ar and imshaoil agus nádúr. An bhfuil do chuid ghaeilge go maith????? Bain triail as an chluiche seo, ón suíomh tallaght4kids. Leirmheasanna ar leabhair Bearla, scriofa ag paisti, do paisti. O Woodlands Junior School. Is cruthúcháin é Santo a rinne Kyle Eileas, Rang a Cúig, i 2010. Thug Kyle cead do scoilsantain.com Santo a usáid. "Santo" was designed by Kyle Ellis, a fifth class pupil in Scoil Santain. Kyle has kindly given us permission to show Santo on the site. Scoil Santain has no control over the content or privacy policies of the above links.